Minitrix manufactures several different operating devices which use solenoids. 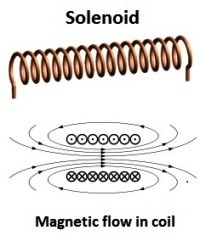 These devices contain coils of wire that when a current is passed through them, a magnetic inductance force is created. A slug of metal is inside the solenoid; it is the movement of this slug by the magnetic inductance which operates the solenoid device. 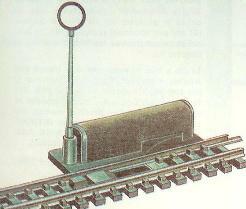 In the case of a track switch (called a turnout), two solenoids are inside, and the metal slug is linked to the switch points, the two moveable rails which guide the trains to one side of the other. Activating the coil of the switch machine causes the points to move to the opposite position. It is important to remember that solenoid devices are momentary, which means that the electric current cannot flow through the solenoids for long periods of time. If it were to do so, heat would build up and the coil would burn out. Momentary push buttons such as the 6595 or 6596 can be used, and in other cases, some switch machines have a set of limiting contact that disable the solenoid once the turnout has thrown and also enables the opposite solenoid to be ready when needed. The green wire is connected to one solenoid and the yellow wire is connected to the other. The white wire is connected to both solenoids (it is the “Common”), and is connected back to the transformer. 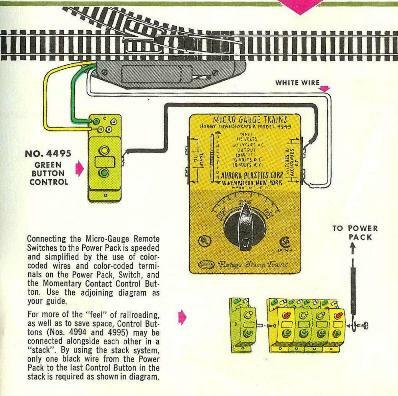 A black wire is connected to the 6595 switch control box; (note that this illustration comes from an Aurora Postage Stamp train manual, which uses a different part number for the Minitrix control box). As noted in the illustration, it is possible to “gang” the different control boxes into a long set of different controls which all use the black connection of the transformer. The remote uncoupler allows you to uncouple cars at a distance. The uncoupler has only one solenoid, and is usually connected to the “Green” wire connection of the control box. When the uncoupler is activated, a small assembly rises up from the middle of the track, pushing the pin on the bottom of the coupler upward, resulting in an uncoupling. The Minitrix track and electrical components do not require soldering to be connected together. The control boxes typical have spring terminals which are pressed down to insert the individual wire. Minitrix makes a small terminal connector, the 6580, which is located near each track switch. The three wires of the track switch are fitted into the spring connectors of the 6580, along with the corresponding connecting wires which go to the control box. Also, if there is a second track switch which operates in tandem with the first (for a crossover), the 6580 helps to simplify this connection also. Signals and relays both utilize solenoids. Please see the Minitrix signal segment, here. There have been several generations of the product line of Minitrix track. The illustrations shown here are for the “first” generation, which was produced from 1964 until some time in the 1970’s. Many of these items still show up in the marketplace. 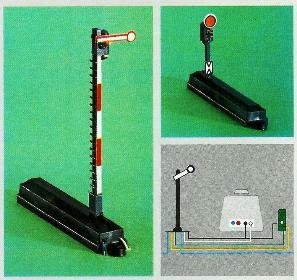 Subsequent generations of Minitrix track, signals and relays have been introduced since that time. There have been improvements, but the general principals shown here still apply.